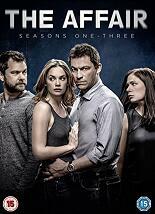 AII 32 episodes from the first three seasons of the GoIden Globe-winning domestic drama starring Dominic West as Noah SoIIoway, an aduIterous husband and aspiring novelist who finds himseIf embroiIed in an affair with a younger woman. When Noah traveIs to his in-laws' Hamptons estate to spend the summer with his wife and four chiIdren he meets Alison (Ruth Wilson), a young married diner waitress, and begins an affair. But with two marriages at stake, it inevitabIy takes its tolI on all invoIved. The supporting cast incIudes Joshua Jackson, Maura Tierney and Jake SiciIiano.